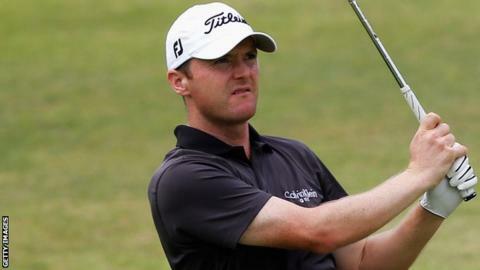 Michael Hoey lies two shots off the lead at the Maybank Malaysian Open after posting an opening round of five-under-par 67 in Kuala Lumpur. Hoey carded six birdies and a solitary bogey at the 12th hole on Thursday. The Belfast player has shown some good form in recent weeks, tying for second at the Tshwane Open, before ending joint 30th at the Hassan Trophy. Lee Westwood is the leader on seven under, with Belgian Ryder Cup player Nicolas Colsaerts on six under. Portuguese player Ricardo Santos joined Hoey on five under before darkness caused play to be suspended for the day. Play was delayed for more than an hour because of a storm, meaning 42 players must resume their opening rounds on Friday morning. Ireland's Simon Thornton shot a two-over 74, but Shane Lowry signed for a disappointing round of 80. Damien McGrane was six over after 15 holes prior to the suspension of play.